SUPPORT CAPITALISM ! IN GOLD WE TRUST, the hatred of money is the root of all evil. 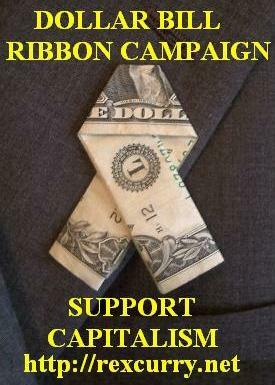 Capitalist Dollar Bill Ribbon Campaign! http://rexcurry.net/moneyribbon.jpg stop counterfeits, counterfeiting, counterfeiters http://rexcurry.net/artlibertarian/libberg2.jpg whip inflation now! vote with your money: free enterprise. COUNTERFEITS, COUNTERFEITING, COUNTERFEITERS Support Capitalism! Given the rising price of gold and the fact that federal spending is totally out of control, the prospect of gold confiscation and criminalizing the private ownership of gold by federal authorities inevitably rears its ugly head. There are few things that federal big spenders hate more than gold. Why? Because they know that, historically, gold has provided the best means by which people could protect themselves against the ravages of a rapidly depreciating currency. The mainstream press often uses the term “inflation” to describe rising prices. That’s incorrect. Actually, when the general price level is rising, that’s a result of inflation, not inflation itself. Inflation is the process by which governments print up the money to pay for ever-increasing expenditures. Why not instead simply increase taxes on people in order to get the money to pay for the soaring expenses? There’s an obvious reason: Taxes make people angry at government officials. It’s much easier and safer to simply print the money because then most people have absolutely no idea that the government is behind what is happening. When prices of commodities, goods, and services start rising in response to the depreciating quality of the money, the average person is likely to blame those in the private sector, such as oil companies, speculators, and businessmen, for the woes. Being unaware of economic principles, people will even demand that federal officials impose price controls and excess- profits taxes on the evil offenders, a demand that the authorities are often willing to oblige. That’s why inflation has always been the best friend of big spenders in government. Although clearly a fraudulent way to finance government operations, history has proven that the possibility that such fraud will be figured out by an ignorant and trusting citizenry is minute. Americans were banned from buying and owning gold American coins under Roosevelt. However, Americans could enjoy more freedom (and the freedom of owning gold and American gold coins) by leaving the U.S.A.'s growing police state and traveling to Switzerland. In Switzerland, gold coins from the U.S. could be purchased in Swiss banks (though it was illegal for Americans to bring those American coins back into the U.S.). The RexCurry.net web site (that archives the work of Dr. Rex Curry, author of "Pledge of Allegiance Secrets"), received a communication from a fan who is a doctor and recalls purchasings U.S. gold coins in Switzerland in 1956. http://rexcurry.net/trip.html It is sad to note that the USA's police state did not allow private ownership of gold until 1973. The Federal Reserve Act was imposed in 1913 and it expanded the government's ability to print, counterfeit and inflate its paper money, leading to more depressions created by the government, including the Government's Depression of 1929. http://rexcurry.net/money.html These measures lessened American faith in government money. Government inspectors found that most banks were healthy, but the socialism stayed, of course. Adding insult to injury, FDR confiscated every American’s gold. That further expanded the government’s ability to counterfeit and inflate its paper money. http://rexcurry.net/moneyart.html Sure, Roosevelt paid Americans more money for the gold he seized than did Roosevelt's socialist comrade Castro. But, it is impossible to overstate the significance of Franklin Roosevelt's confiscation from Americans. The hatred of money is the root of all evil. SUPPORT CAPITALISM ! http://rexcurry.net/moneyribbon.jpg IN GOLD WE TRUST! Such ignorance and such trust in government did not characterize our American forefathers. Having studied economics and monetary history and having experienced the ravages of inflation firsthand with the Continental currency, they decided to establish a monetary system based on gold and silver coin rather than paper money. They knew that while the government could still debase the currency by “clipping” a bit of each gold coin it received before putting the coins back into circulation – a process of plunder that governments used before the printing press was invented – that was a relatively small danger, especially compared with paper money, which could be expanded at will through the printing press. A close reading of the Constitution – the document whose purpose was to protect the American people from federal officials – leaves little room for doubt about the intentions of the Framers. As you read the following excerpts from the Constitution, ask yourself: Did the Framers intend for our country to have a monetary system based on gold and silver coins or on paper money? The Congress shall have Power . . . To coin Money, regulate the Value thereof, and of foreign Coin . . . ; To provide for the Punishment of counterfeiting the Securities and current Coin of the United States . . . . The plain meaning of those words can lead but to one conclusion: The Framers rejected paper money in favor of money they could coin, which meant gold and silver coins. And that, in fact, is what happened. From the very inception of our nation and through most of the 1800s and early 1900s, the American people used gold and silver coin as their money. While the system wasn’t perfect in that it still left the determination of money under government control rather than the free market, there were nevertheless two remarkable results of this system. One, the gold standard eliminated the power of federal officials to do what governments had historically done to their citizenry – plunder and loot the people through the issuance of depreciating paper money. Two, the gold standard had an enormously positive effect on capital markets, which was one of the major contributing factors for the tremendous economic expansion and prosperity that characterized the United States through most of the 19th and early 20th centuries. These two powers were not inconsistent with a monetary system based on gold and silver coin. People paid their taxes with their money, which meant gold and silver coins. And if government wished to borrow money from the citizenry, it would issue a promissory note or “bill” promising to pay back the gold coin that it received from the lender. But everyone understood that the actual money was the gold or silver coins, not the promissory notes. The notes simply evidenced the promise to repay the money. “Bills of credit,” which Article 1, Section 8, prohibited the states from “emitting,” were commonly understood to be paper money. That part of the Constitution expressly prohibited the states from issuing paper money. Why isn’t there a similar constitutional restriction for the federal government? The answer lies in the overall philosophy of the Constitution. In establishing the federal government, the Constitution made clear that the government’s powers were limited to those enumerated in the Constitution. If a power wasn’t enumerated, it was understood that it could not be exercised. Thus, the relevant inquiry would be: Was the power to emit bills of credit (that is, issue paper money) among the express powers granted to Congress? The answer is “no.” The power that was given was “to coin money,” something that most everyone would concede is difficult to do out of paper. The power to “regulate the Value thereof” simply meant that the Congress would have the power, for example, to decide the exact weight and fineness of metal that would go into a gold coin or a silver coin. The paper money of today still contains a hint of what it once represented – a promise to pay money, rather than money itself. Take a dollar bill out of your billfold. Notice that at the top it states, “Federal Reserve Note.” Why is it called a “note”? Because it represents, somewhat perversely, what such a note once constituted for our American ancestors – a promise to pay something, namely gold. Today, such notes are what is termed “irredeemable” – that is, they cannot be redeemed in gold or silver coin. They are promises to pay nothing. Thus, while the federal government could borrow money (i.e., gold and silver) from the private sector, its bills and notes evidencing the debt did not – and could not – legally circulate as money. However, there was one type of paper money that began circulating in the late 1800s and early 1900s, but it was totally different from promissory notes. This paper money consisted of what were called gold certificates and silver certificates. They worked like this: A person would deposit, say, $5,000 in gold coins with the U.S. Treasury and receive in return a certificate certifying that $5,000 had been deposited. Thus, the certificate was in the nature of a warehouse receipt rather than a loan. At first, the certificates were issued in the name of the depositor. Over time, they began to be issued in the name of “bearer,” which meant that the holder of the certificate could transfer it to another person, who could then go to the Treasury, present the certificate, and receive his gold. So how did things change so dramatically? How did it come to be that the monetary system of the United States is now based on irredeemable paper money? Why are gold and silver coins and gold and silver certificates no longer used as our country’s money? Given that there was never a constitutional amendment changing America’s monetary system, how did things change so radically? The answer lies with two presidents – Abraham Lincoln and Franklin D. Roosevelt. Their respective actions revolutionized our nation’s monetary system. Their actions culminated in a monetary system that has enabled federal authorities, decade after decade, to fraudulently plunder and loot the American people, even to the point of denying them the ideal means – ownership of gold – by which to protect themselves from the federal government’s immoral and insidious monetary behavior. Presidents Abraham Lincoln and Franklin Roosevelt revolutionized the monetary system of the United States and set the nation on the road of inflationary plunder that has characterized other nations in history. The actions of these two presidents also provide a textbook example for understanding the animosity and antipathy that government officials historically have had toward precious metals (i.e., gold and silver coin) as a medium of exchange. Through the U.S. Constitution, the American people brought into existence one of the soundest monetary systems in history. It wasn’t perfect in that it didn’t provide for a free market in money, but, by establishing gold and silver coin as the official money for the United States, it did protect the American people from the inflationary ravages of paper money. Keep in mind, first, that our American ancestors didn’t trust government, for they understood that the greatest threat to the liberty and well-being of a citizenry lay with its own government. Thus, while the Constitution brought the federal government into existence, it simultaneously limited its powers to those enumerated in the document. If the power wasn’t listed, it simply could not be exercised, no matter how important the need, no matter how severe the crisis or emergency. To make certain that government officials got the message, soon after the Constitution was enacted several amendments were added providing guarantees and expressly enumerating fundamental rights that federal officials could not violate. It bears repeating: The Constitution was born from the severe distrust that our American ancestors had for the federal government. They understood what people throughout history had learned the hard way – that more often than not, people had lost their freedom at the hands of their own government. One of the ways that our ancestors attempted to protect their freedom and property from federal assault was through the establishment of a monetary system based on precious metals, specifically gold and silver coin. As students of history, they understood the inflationary horrors that governments all over the world had inflicted on their citizenry through the issuance of paper money. Moreover, they themselves had experienced the ravages of the Continental currency during the Revolutionary War (“It’s not worth a Continental”) and the inflationary damage during the period of the Articles of Confederation, when the states were free to issue paper money. Thus, it is not surprising that the Framers would establish a monetary system based on gold and silver coin. They wanted to ensure that their own government could not use the printing press to plunder and despoil them through the issuance of paper money. In 1862, Congress granted Lincoln’s request to issue $150 million in Treasury notes to finance the war effort during the War Between the States. In simple terms, the federal government was borrowing money, and the money it was borrowing was the gold and silver coins that had been established as the legal money under the Constitution. The situation would be comparable to a person who walked into a bank in 1862 and asked to borrow $10,000. If the loan were granted, the customer would sign a promissory note promising to pay the bank $10,000, and the bank in turn would deliver $10,000 in gold coin to the customer. When the note came due, the customer would be required to pay the bank back $10,000 in gold coin and he would receive back his promissory note with the notation “Paid” or “Cancelled” on it. To belabor the obvious, the money was the gold coins. The note was a promise to repay the money, not money itself. The same principle held true with respect to the Treasury notes authorized to be issued by the Lincoln administration. Everyone understood that the notes didn’t constitute money but rather were a promise to pay back money (i.e., gold coins) it received in exchange for the notes. When the notes came due, the Treasury would have to repay the lender in money – that is, in gold coins. What did “legal tender” mean? It meant paper money. And it meant that for the first time since the founding of the nation, Americans would be required to accept the federal government’s paper money as a medium of exchange. Why was that important to Abraham Lincoln? Like so many other government officials in history, Lincoln was resorting to the printing press – inflation – to finance his war expenditures. In 1862, Treasury notes were trading at a deep discount relative to their face value. For example, a note promising to pay $1,000 might fetch in the marketplace only $500 because of the doubts that people had regarding the federal government’s ability to repay the loans in gold when they ultimately came due. In the absence of the legal-tender law, even though the government could continue borrowing money, people could still protect themselves from the ravages of inflation by stipulating their contracts in gold coin. The effect of the legal-tender law was to remove that protection by requiring creditors to accept depreciated paper money in lieu of gold and silver coin stipulated in the contract. That was exactly what happened to Henry Griswold and many other people. Prior to the enactment of the legal-tender law, Griswold had lent $11,250 to Susan Hepburn. Obviously, both parties understood that when the note came due Hepburn would be required to repay the debt in the medium in which she had received the loan – gold coin. When the note came due, however, Hepburn delivered to Griswold paper money – that is, U.S. Treasury notes that were the subject of the legal-tender laws. Griswold objected because the notes, while nominally in the sum of $11,250, were worth significantly less in the marketplace. In other words, what Hepburn effectively did was go into the marketplace and use, say, $5,000 in gold coin to purchase $11,250 in Treasury notes and then handed the notes to Griswold in payment of the debt. He refused to accept the payment and instead demanded gold coin with a face value of $11,250 plus interest owed. ... The power to coin money is, therefore, a power to fabricate coins out of metal as money, and thus make them a legal tender for their declared values as indicated by their stamp. If this be the true import and meaning of the language used, it is difficult to see how Congress can make the paper of the government a legal tender. With Knox v. Lee the seeds were sown for a monetary revolution in American life – a revolution that would bring the inflationary plunder and moral debauchery that have characterized nations throughout history. The revolution began with Lincoln. But it would culminate in one of most massive assaults on private property in U.S. history – President Franklin Roosevelt’s nullification of gold clauses in contracts and his confiscation of gold from the American people. The gold seizure was no different in principle from Fidel Castro’s seizure of homes and businesses more than 25 years later in Cuba, an episode that U.S. officials still rail against while praising what Roosevelt did. Sure, Roosevelt paid Americans more money for the gold he seized than Castro paid Cubans and American companies for the property he seized, but the principle was the same: the rulers in both Cuba and the United States could appropriate people’s property at their whim. What was Roosevelt’s justification for the gold seizure? He said that it was necessary to battle the Great Depression. Now, think about that for a moment. How in the world could the seizure of people’s gold relieve the consequences of the Great Depression? Let’s say that I have $10,000 in gold coin in my house. The Depression hits. Prices plummet. Unemployment soars. How is my delivering my gold to the federal government in return for depreciated paper money going to relieve anyone else’s distress? No, the real reason for Roosevelt’s gold seizure was twofold: First, he seized people’s gold for the same reason that Castro later seized people’s homes and businesses – to enrich the coffers of the federal government. Second, but more important, he did it to prevent the American people from protecting themselves from the onslaught of ever-depreciating paper money that he planned to use to finance his ever-extravagant welfare-state programs. Keep in mind that the Framers had implemented a gold standard so that the American people would be forever protected from the destructiveness of inflation. 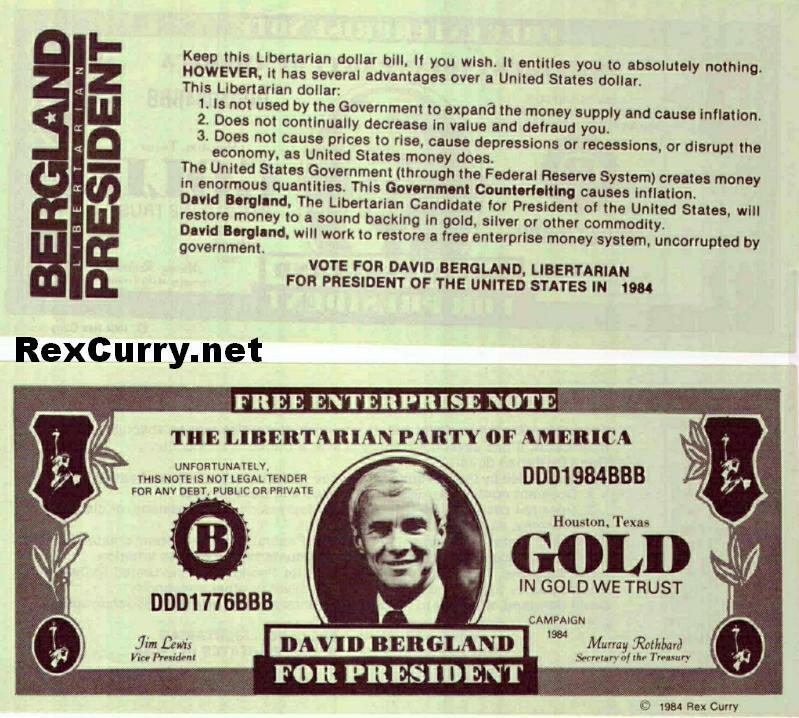 It was the gold standard – that is, the requirement that the federal government redeem all its paper notes and bills in gold – that had operated as a restraint on government’s ability to print ever-increasing amounts of paper money. The gold standard’s positive effect on capital markets was also one of the primary reasons that the United States rather quickly became one of the most prosperous nations in history. With his seizure of gold, Franklin Roosevelt revolutionized the monetary system of the United States – and without even the semblance of a constitutional amendment. It is instructive to understand how he pulled this off in a legal sense. In issuing his executive order, Roosevelt relied on the Trading with the Enemy Act, which had been passed in 1917 as part America’s war against Germany in World War I. Yes, World War I, the infamous war that was supposed to make the world safe for democracy! This “temporary emergency” law, which should have expired with the end of the war, had instead been left on the books through the 1930s. This is the law that Roosevelt relied on in issuing his executive order confiscating people’s gold. There’s another significant aspect to the executive order – the issuance of the order itself. That is, Congress did not enact a law expressly authorizing the gold seizure. Instead it was accomplished simply through a decree issued by the president. What the Congress had done is delegate its power to make certain laws to the president, essentially vesting Roosevelt with dictatorial powers. In March 1933, Congress amended the Trading with the Enemy Act to vest the president with the power to declare “national emergencies” and then issue necessary decrees to deal with such emergencies, including even setting criminal punishments. Roosevelt and his Congress did not stop at seizing the gold of the American people and making it illegal for them to protect themselves from the ravages of inflation. They also nullified every clause in every contract, both government and private, that tied the financial obligation to gold. How did these gold clauses operate? Let’s say a corporation issued a 100-year bond for $20, promising to pay 3 percent interest. Any lender would ask himself the obvious question, “Why wouldn’t this bond be worthless in a hundred years because of inflation?” To ensure that that wouldn’t happen, the note would contain a “gold clause” which stipulated that the company had to repay the bond, both principal and interest, in the same standard of gold that existed at the issuance of the note. So let’s say, for simplicity’s sake, the $20 bond was issued in 1885, with $20 equal to a one-ounce gold coin. Let also say that because of inflation, when the bond became due 100 years later, it would take $100 in paper notes and bills to buy one ounce of gold. With the gold clause in the $20 bond, the debtor would have to pay the creditor either a one-ounce gold coin or $100 in paper notes (plus interest). With the gold clause nullified, all the debtor would have to pay would be $20 in paper money (plus interest), even though it would purchase only one-fifth of an ounce of gold at the time of repayment. It’s not difficult to imagine the adverse effect that Roosevelt’s actions had on long-term capital markets. The constitutionality of Roosevelt’s gold-confiscation decree was never addressed by the U.S. Supreme Court. There were few federal prosecutions, possibly because Roosevelt didn’t want to take the chance that the Supreme Court would declare his confiscation unconstitutional. Better to simply let the lambs who were meekly complying with the law continue filling the government’s coffers with gold and leave the ones who weren’t obeying the law alone. Under the challenged statutes it is said the United States have realized profits amounting to $2,800,000,000. But this assumes that gain may be generated by legislative fiat. To such counterfeit profits there would be no limit; with each new debasement of the dollar they would expand. Two billions might be ballooned indefinitely – to twenty, thirty, or what you will. What was the reaction of the American people to Roosevelt’s gold seizure? By the 1930s, most of the United States had been under systems of public (i.e., government) schooling for at least three decades. After years of such indoctrination, even though Americans had not yet become dependent on the federal government’s welfare dole that Roosevelt was initiating, most of them nevertheless now deferred to the wisdom of federal officials to deal with such complicated subjects as economics, depressions, and monetary policy. Thus, when Roosevelt issued his decree, it was not met with massive protests and demonstrations but rather with the same degree of meekness and submission that many (but certainly not all) of the Cuban people would display when their homes and businesses were confiscated by Castro several decades later. The additional value of the public-school indoctrination was that it effectively immunized federal officials from having to bear responsibility for the consequences of their own wrongful conduct. For when U.S. officials announced that the 1929 stock-market crash and the resulting Great Depression were all the fault of “free enterprise” and that such things as the gold seizure and the New Deal were necessary “to save free enterprise,” entire generations of public-schooled Americans had no idea that they were being misled. If Americans had known the truth – that the stock-market crash and Great Depression, along with all the financial devastation and unemployment – had actually been the fault of the Federal Reserve, there would have been considerable anger, perhaps even violent revolts, against the federal government. In 1974 Congress made it legal to own gold once again, providing Americans the means to protect their wealth from the inflationary propensities of the federal government. Is there a possibility, however, that federal officials could confiscate gold again and make it illegal to own it? You bet your bottom gold dollar there is. For one thing, the Trading with the Enemy Act is still on the books and is still being used as the basis for presidential decrees. For another, ever since the Roosevelt administration, federal officials, assisted by the Federal Reserve, have never desisted from issuing ever-growing quantities of paper money, an inflationary process that has ravaged people’s savings. Finally, federal officials hate gold because its rising price in the face of inflation provides a public and an easily readable market message to the citizenry that government officials are destroying the currency. And make no mistake about it. If another U.S. president issues a gold-confiscation decree, it will be enforced violently and brutally by federal officials. In the climate of the perpetual “crisis” known as the “war on terrorism,” combined with an “economic emergency,” it is not difficult to imagine that federal officials would conduct warrantless raids on banks to search bank records and safety deposit boxes and prosecute dangerous “enemy combatants” and “terrorist sympathizers” who show they “hate their country” by violating the law against the ownership of gold. The ultimate solution to this financial chaos, destruction, and morass lies in sound money. The ideal is a free market in money, as the Nobel Prize-winning economist Friedrich A. Hayek observed. The second-best solution is the type of gold standard established by the Framers, where gold and silver coin are the official money and where the federal government is required to redeem all bills and notes in such money. Both solutions would necessarily entail the abolition of one of the most powerful engines of financial destruction in American history – the Federal Reserve System – as well as the repeal of all legal-tender laws. I sincerely believe ... that banking establishments are more dangerous than standing armies, and that the principle of spending money to be paid by posterity under the name of funding is but swindling futurity on a large scale." -- Thomas Jefferson to John Taylor, 1816. "Paper is poverty,... it is only the ghost of money, and not money itself." -- Thomas Jefferson to Edward Carrington, 1788. "Scenes are now to take place as will open the eyes of credulity and of insanity itself, to the dangers of a paper medium abandoned to the discretion of avarice and of swindlers." --Thomas Jefferson to Thomas Cooper, 1814. "I now deny [the Federal Government's] power of making paper money or anything else a legal tender." -- Thomas Jefferson to John Taylor, 1798. "The maxim of buying nothing without the money in our pockets to pay for it would make of our country one of the happiest on earth." --Thomas Jefferson to Alexander Donald, 1787. "Every discouragement should be thrown in the way of men who undertake to trade without capital." --Thomas Jefferson to Nathaniel Tracy, 1785. "I am an enemy to all banks discounting bills or notes for anything but coin." "It is said that our paper is as good as silver, because we may have silver for it at the bank where it issues. This is not true. One, two, or three persons might have it; but a general application would soon exhaust their vaults, and leave a ruinous proportion of their paper in its intrinsic worthless form." --Thomas Jefferson to John W. Eppes, 1813. "Everything predicted by the enemies of banks, in the beginning, is now coming to pass. We are to be ruined now by the deluge of bank paper. It is cruel that such revolutions in private fortunes should be at the mercy of avaricious adventurers, who, instead of employing their capital, if any they have, in manufactures, commerce, and other useful pursuits, make it an instrument to burden all the interchanges of property with their swindling profits, profits which are the price of no useful industry of theirs." "We are now taught to believe that legerdemain tricks upon paper can produce as solid wealth as hard labor in the earth. It is vain for common sense to urge that nothing can produce but nothing; that it is an idle dream to believe in a philosopher's stone which is to turn everything into gold, and to redeem man from the original sentence of his Maker, 'in the sweat of his brow shall he eat his bread.'" --Thomas Jefferson to Charles Yancey, 1816. "The incorporation of a bank and the powers assumed [by legislation doing so] have not, in my opinion, been delegated to the United States by the Constitution. They are not among the powers specially enumerated." --Thomas Jefferson: Opinion on Bank, 1791.